By all accounts, the Peaceful Playground at Victoria Elementary School (VES) MN is fulfilling its mission: to bring peace and harmony to the playground, get kids moving, hopping, and skipping, and most of all, teaching kids it’s fun and simple to just play. Visitors to the VES playground on the west side of the school, just outside the school cafeteria, will see many play areas with playground stencils painted in bright colored grids and circles all over the asphalt. There are two tether ball courts, three hopscotch game areas, grids with the alphabet and numbers for bean bag toss, a whimsical wall of fish perfect for target practice, and the very, very popular Four Square Scramble. VES teacher Ryan Meulemens learned about Peaceful Playground during a national physical education conference last year and presented to Principal Nancy Wittman who presented it to the school’s PTO, which agreed to fund it. 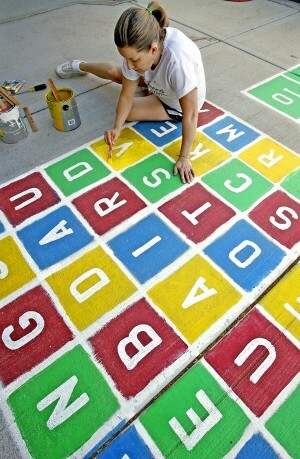 Last summer, a group of teachers and parent volunteers paint the designs onto the playground’s surface using templates. The school’s physical education teachers taught teachers and paraprofessionals all about the games and rules before school started. In the process, teachers rediscovered the fun of simply running, jumping and skipping, too. Like birthday present , “It was embraced by the whole school staff,” said Principal Nancy Wittman. “The multiple playground games teach children common rules and problem-solving skills, whether you’re in kindergarten or in fifth grade. And it makes recess more fun. Kids have unstructured play with multiple options enabling motor activity. And, it lets them run off energy and rejuvenate themselves. “The response (from the children) has exceeded our hopes,” Wittman said. “This is year five for us (since the school’s opening) and so adding this to the playground was like celebrating a birthday. Until this school year, the playground looked like a typical playground at most schools. A plain black asphalt surface that many children used for kickball. Children who didn’t want to play on the playground equipment or play kickball, tended to stand on the sidelines or by the entry doors, waiting for the 20-minute recess to end. Now, everyone has an activity they can participate in, either by themselves or most often with other children. Another benefit from the program is that children are learning to resolve conflicts among themselves, said physical education teacher Stephanie Heier. Along with learning the games and rules, Heier and other teachers taught children to play Rock Paper Scissors to settle disagreements. Conflicts are also reduced because the game rules and fouls are the same for all the grades. Teachers and paraprofessionals received decks of laminated cards with games instructions and rules. Consistency is key, Heier said. All the rules ar and making sure that kids know that no matter what grade you’re in, the rules and fouls are the same. It also makes it easier for teachers and paras to referee. Heier notices that more kids are participating and playing at recess. More about Peaceful Playgrounds Recess Program.